Violin strings are important in creating the sound quality of a violin. It influences the sound produced by your violin so make sure to choose the right string for your instrument. Also, the strings affect the projection, playability, and resonance of your violin. So how do you choose the best violin strings if you’re just a beginner? Know the basics of violin strings. To save money, it’s important to understand the various traits of string that affect the sound produced by violins. The core material can be a synthetic nylon, steel, or gut. It influences the quality of tone of the violin string. Another factor to consider is the gauge or the actual thickness of the violin strings. It affects the tonal quality of the string; for instance, a thick string produces robust volume. Lastly, check out the string’s tension to make sure it will produce great tone quality. Determine the right type of string that matches your style. Beginners in playing the violin may still be learning the instrument basics so knowing what music that should be pursued be identified first. For instance, Country style violinists use steel core strings in order to produce brighter tones. Typically, professional musicians use synthetic and gut core in order to produce more mellow, richer sounds. On the other hand, beginners and violin students can choose synthetic core string for better playability. It gives easier projection, responsiveness, and warmth while playing the instrument. Buy the string which makes you happy. If you have a specific violin string that you want to use, then feel free to buy it. Sometimes, what makes us feel confident helps us create the perfect music that our heart desires. You can try the strings before purchasing them just to make sure. 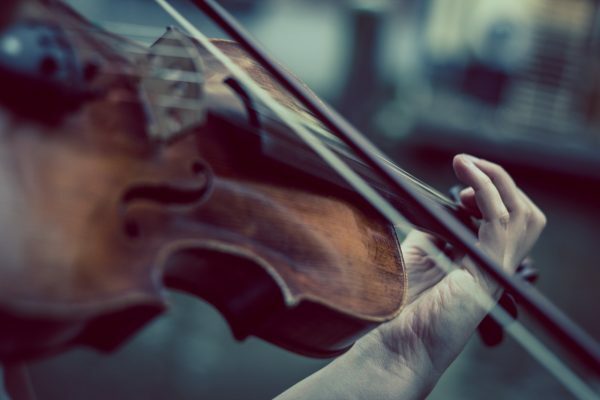 Aside from these factors, it’s also important to consider your budget when buying violin strings as a beginner. In addition, don’t invest in the most expensive string if you’re not sure you’re going to use it in the long run. Don’t be afraid to ask for professional assistance if you’re uncertain of your choice. Just keep these tips in mind so you can find the right violin string you need.